Easter Means Osterfladen Tart Recipe Time. A Swiss Favourite. Yeah, There’s Paula on my Left Arm. pop quiz: the lyric above is from what song and artist? clue: originally it was Flo on the left, but, I guess, the lads at the seaside made it more friendly for those gadding about state-side with Paula. Mike and Paul, a couple of friends of ours, run Pinnacle Walking Holidays, a small walking holiday company. In summer they offer walking holidays in the ‘winter ski resorts’ of ‘Chamonix‘ and ‘the Dolomites‘. On their holidays in the French Alps, Paula does the all the cooking so her recipe book is bulging. I’ve taken a few of her favourites to share. Paula always gets getting excited when she spots a huge display of chocolate eggs in a shop. She is not really a chocoholic but believes there is something special about Easter. It signifies Spring has arrived, bringing baby lambs, light mornings, light evenings and better weather. 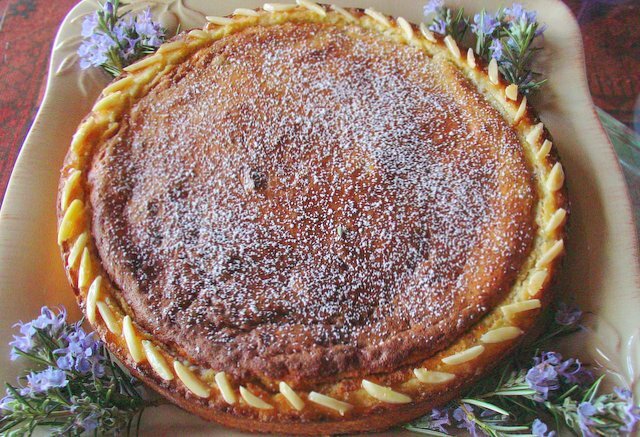 Mike and Paula spent a lot of time walking in the Bernese Oberland of Switzerland and one of their favourite puddings was the Osterfladen Tart (the Easter Tart). Try it, it is delicious. How to Make Osterfladen Tart. In a saucepan, bring the milk to the boil with a pinch of salt. Add the rice and simmer gently, stirring often, until the mixture has thickened; about 25 minutes. Transfer to a bowl and cool, put in fridge to chill completely. Roll out the pastry on a well-floured surface to about 0.3cm thick, large enough to line a 23cm fluted tart case. Place the tin on a baking sheet and then line with the pastry, pressing into the corners and sides. Trim any excess from the edges and chill for 20 minutes more. Prick the pastry base with a fork, then line with parchment and baking beans. Bake for 15 minutes in a pre-heated oven 200oC, remove the parchment and beans, then return to the oven for 5 minutes more; set aside to cool. Beat the sugar, ground almonds, cream, lemon zest and egg yolks into the rice. In a separate bowl, whisk the egg whites to stiff peaks. Mix about one third of the egg whites into the rice mixture to loosen it. Gently fold the remaining egg whites into the rice. Spread the jam over the tart base and spoon the rice filling on top. Place into a preheated oven, 180oC and bake for 30-35 minutes, until golden brown, puffy and set. Serve generous slices, at room temperature or chilled, dusted with icing sugar. pop trivia: back in 1961 ‘Dion’ had a hit with ‘The Wanderer’; since then it has been covered by many artists. In 1964, ‘The Beach Boys’ included ‘The Wanderer‘ on their album ‘Beach Boys Concert’. They changed most of the girls’ names from the original. The tune is a favourite with fans of Bolton Wanderers FC. For more of Paula’s scrumptious recipes have a look at her online Chalet Cookbook.